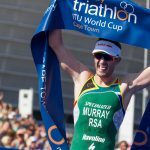 The 2018 ITU World Triathlon Series officially began on Friday, March 2 when elites Henri Schoeman (RSA) and Rachel Klamer (NED) collected gold at the 2018 ITU World Triathlon Abu Dhabi. Joining Schoeman on the men’s podium was Mario Mola (ESP) and Vincent Luis (FRA). While on the women’s side Great Britain’s Jessica Learmonth earned the silver medal and Natalie Van Coevorden took bronze. Starting off the year making the history books, Rachel Klamer (NED) became the 21st woman to ever win an ITU World Triathlon Series race after her season-opening victory at the 2018 ITU World Triathlon Abu Dhabi. After a smart and conservative race strategy that brought her through the swim and bike, Klamer gave everything she has on the final lap of the run to earn the gold medal and the first WTS victory of her career. “I am so happy, there was no way I was expecting this. I have to say I was quite scared on the bike because the last few months I have been training on only straight roads and didn’t do any corners. There was a lot of women crashing so I just decided to take it easy, ride hard, but just go easy through the corners. I ended up sitting behind a couple crashes, which wasn’t smart so I had to chase one whole lap to get back to the front pack. But I am happy I stayed on my bike. When we started running I tried to focus on my breathing because normally at the start of the season I often get side stitches. 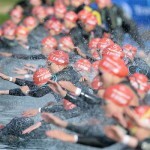 I stayed at the back of the back on the first lap, but on the last lap I thought I would just give it a try,” said Klamer. The silver medal went to Great Britain’s Jessica Learmonth, who added another silver medal to her belt after taking second in Stockholm last year. The medal gives the Brit good standing going into her last month of training before the Commonwealth Games in Gold Coast in April. “With it being the first race I thought, well if I have a bad race at least I have a month until to try and recover for the Commonwealth Games. Likewise, I have always done well here, but we still have a month to go and I have a lot of training to prep for it, but it gives me a bit of confidence and we will see what it brings,” Learmonth said. Third place went to Aussie Natalie Van Coevorden, who earned her first-career WTS medal from a close photo finish at the line. 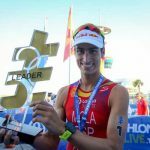 The 2018 World Triathlon Season has officially begun and its first-collected gold medal went to South Africa’s Henri Schoeman as he claimed victory at the 2018 ITU World Triathlon Abu Dhabi. Crossing the finish line to collect the tape after leading out of the swim, bike and run, the Abu Dhabi gold was only the second WTS win of Schoeman’s career. 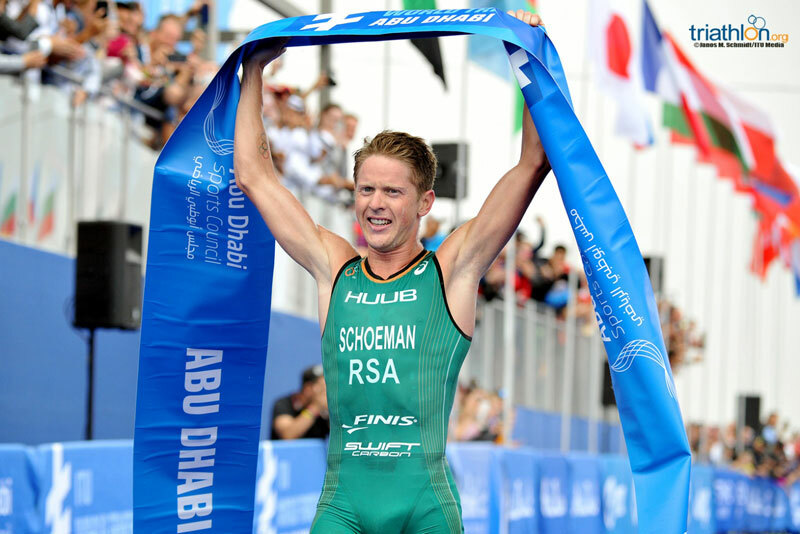 And despite the unusual desert rain that caused some slickness out on the bike course for many athletes, Schoeman managed to come out on top and become only the second man in WTS history to win the race after leading in all three disciplines from start to finish. “To be honest, I am just so happy there really is no words to explain. It has been a tough year since the Olympics and it just feels so good to have a statement. I just tried to play it safe out there. I found myself in front on the bike and before I knew it I had a gap and the gap grew. 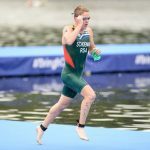 To just be honest I was having fun out there, I was telling myself that if they catch me on the run, well whatever because I had fun on the bike and I was safe.” Schoeman said. Earning the silver medal was Spaniard Mario Mola, who won in Abu Dhabi in 2015 and 2016. While the bronze went to Vincent Luis (FRA), who repeated his third-place position from 2017.